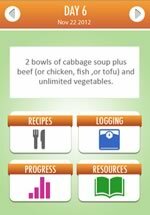 The Cabbage Soup Diet is a 7 day meal plan, aimed at achieving fast weight loss with use of a simple cabbage soup recipe. It is not a long-term weight loss solution but is known to be effective over the short term. Apparently it originally came from a hospital (Sacred Heart Hospital) to stimulate weight loss for surgery patients – but this cannot be verified. The change from some of our normally junky eating habits can be beneficial. 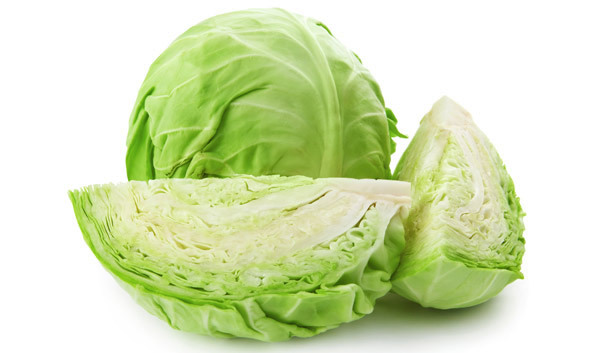 Vegetables from the Brassica family (such as cabbage, broccoli, cauliflower) have been found to aid in preventing cancer. Many say they enjoy eating the soup. This diet is not recommended for more than a week because it does not offer complete nutrition. 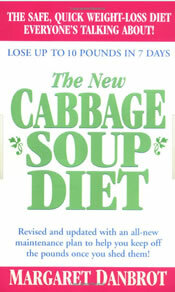 Some complain that the Cabbage Soup a little too bland. It tracks your progress and is loaded with recipe variations as well as step by step directions on how to make the soup as well as stick to the diet plan. This can make the diet much easier to stick out for 7 days. How many times a day do you eat the soup? May I know if oats can be eaten for breakfast while on this diet. Works for me, in the short run….When I finish the challenge, or quit at day 4, I use the leftover cabbage soup for minestrone. Never wasted a drop, just added sweet Italian sausage (sautéed), a cup or two of thin spaghetti (cooked), a handful of fresh spinach, and a little fresh grated parm. Not bad, and I don’t feel guilty! can you take a one a day vitaman with this diet plan? Yes…I take a Centrum Silver daily wheterh on the diet or not…Still lost 10 pounds in 2 weeks. Briefly – I’m going, on a tour and we will be going to a German restaurant on my “banana day”. I can pass on the the frauleins carrying the mugs of German beers. But when it comes to the Sausage with kraut, Sauerbraten, Wiener schnitzel, etc. I don’t think there will be any bananas and I don’t think it would bee too cool to be packing bananas in my pockets. Do I have to restart the 7 day plan or can I take 1 meal off? Thank you for the post! This diet looks interesting. I haven’t tried it yet, I’m searching for an rapid weight loss diet. I’m going on an event in three weeks, and I want to reach a healthier weight by then. What’s your thoughts on this diet? Can type 2 diabetics do this diet safely? can i go on a diet while on arv medication? Hi Nono, You really should consult your doctor about this.